The holidays, as far as I’m concerned, are over. That’s because, to me, Halloween is like Thanksgiving, Christmas and New Year’s Eve all in the same day. Just awesome. I also tend to throw caution to the wind with one hand, while unwrapping and cramming fun size bars and waxy orange sugar into my mouth with the other. This would all be well and good if I were one of those people who can eat forever and never gain weight, but sadly, I am not, and if I’m not losing weight, I’m gaining it. As such, I’m back on the wagon. Now I’ve heard that it’s in poor taste for a chef to discuss calories (and if I could find that quote I might even link someone), but my foodie license feels a little safer knowing that I regularly blog baked goods that are not safe by the stretches of any diet’s imagination. And you know, even though *I* am a little calorie-conscious, that doesn’t stop me from reading all manners of delicious baking blogs (among my new favourites is Patticake), and I get really excited when I see something low cal enough to eat for dinner. And this brings us to POACHED EGGS. In this case somethin-somethin is a combination of a light (90 calories! 9 grams of fiber!) English muffins, fat free plastic American cheese (30 calories! No fat!) 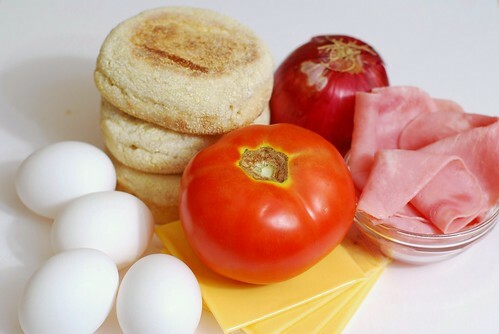 , a real live egg (twice the calories of the fat-free version, but it pays off here), and sliced ham, which is surprisingly not-that-bad-for-you (30 calories, just 1.5g fat). And then an attempt at veggies, a la the ever-versatile tomato and onion. You can’t see it, but there’s an egg cooking here. Then stack that thing on an already-high stack of the other stuff, and uh, voila! Diet dinner. Put whatever you want on there, and even on your plate. It’s your dinner, and your eggs. Everything tastes especially yummy coated in that delicious creamy egg yolk which, for the calories, is a pretty good deal. You don’t have to be a dieter to appreciate this dish. So what do you do with your poached egg, the creamy caviar of eggs that don’t belong to fish? Also, a note on fat free fake cheese: don’t knock it til you try it melted on something. And of course, you can use whatever cheese you want. oh…my….god. simply luxurious. this dish looks to die for. this dish is one that would be included in a gourmet dinner. it has such a delicate look – a work of art. i am truly impressed with it. If there’s one thing that I started to eat a lot more of in the past year, it’s poached eggs. And I hardly ever eat them for breakfast they’re a mainstay in my dinner repertoire.I topped it off with two poached eggs and parmesan. The runny egg yolks made a super sauce, and this was a magnificent dish. We haven’t had poached eggs for a while and I know my family would truly thank me for making them. 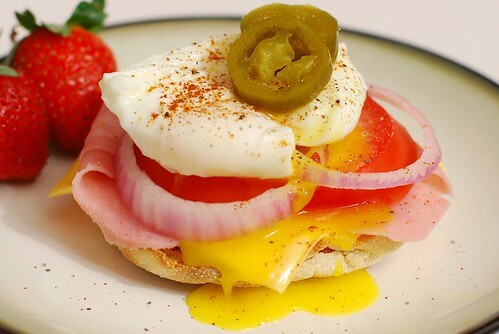 Yours with the runny yolks look perfect! Well, look at that. It’s perfectly indulgent with that yolk streaming out over the english muffin. Just made this–I haven’t had it in forever. YUMNUMNUMNUM! Thanks for reminding me, so it can jump back into the recipe rotation. Please post more stuff! I’ve yet to try making poached eggs, but I have a feeling that if you invited me to your home and made this dinner, I would probably never try them. This is beautiful and even better because of the low calories, fat, etc. Wonderful!! Anonymous – Those are big compliments! Many thanks! kesha – I’m with you on that. 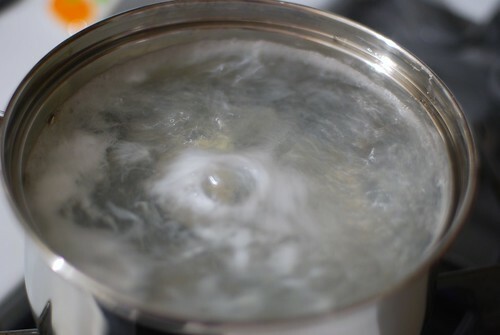 tami – do you usually not do yours runny? lo, tigerfish – thanks dudes! Amanda – yeah, I need to start doing healthier posts . . . or any posts, actually, I’ve been under the weather for like two weeks now! esi – DO IT! Seriously, you won’t regret. Mmmm. Can’t beat dripping yolk. This looks FANTASTIC! 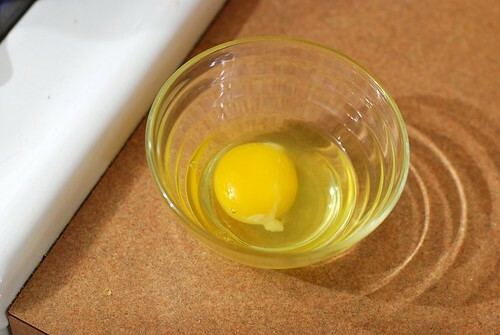 Adding a bit of vinegar to the water really helps with keeping the egg together when poaching. P.S. – I am adapting your rainbow cake idea to make a white and pink strawberry cake.